In focus: A language school in Paris, Wall Street Institute, that depends on the cachet of the Wall Street name. The company, which has more than 400 schools around the world, has opened 43 this year. Paris: For years, advertisements in the Paris Metro have bluntly posed the question dreaded by so many Parisians: “Do you speak English?" And unlike some harried commuters on the city’s subway system, the cheerful young people on the posters respond with an upbeat, “Yes! I speak Wall Street English." The ads promote the Wall Street Institute, a chain of English-language schools. As Wall Street has teetered and the world financial system has hung in the balance, the ads have remained prominently on display. While the image of the US has taken a beating overseas in recent years, to the frustration of some US marketers, until recently that was largely because of an unpopular foreign policy. Wall Street, on the other hand, has remained an emblem of American economic might—not always admired, but often envied. Can that continue? Or will the financial crisis deal a further blow to Brand USA? Might Wall Street English now become as unpopular overseas as, say—Crawford, Texas, English? Based on surveys of people in 20 countries, the researchers measure how each of 50 nations’ “brands" ranks against the other 49, based on factors ranging from governance to culture to the economy. The US ranked seventh overall, behind Germany, France, Britain, Canada, Japan and Italy, in the most recent survey, published in September. But on the part of the index measuring attitudes about countries’ political leadership, the US ranked 22nd, lowest of the major Western democracies in the index. The US economic “brand" was much stronger, placing in the top three in the perceived quality of exports and in the attractiveness of its investment climate. The research was conducted before the credit crunch intensified. If a survey were to be taken now, would US’ economic brand decline? “Personally, I don't see this falling substantially, depending on how we come out of this crisis," said Xiaoyan Zhao, senior vice president at GfK Roper Public Affairs and Media, a New York subsidiary of GfK, which is based in Nuremberg, Germany. “For people around the world, day in and day out, it’s about the quality of goods and services, not so much about the performance of markets." But some US marketers may be more concerned. Allyson Stewart-Allen, a consultant in London who works with US companies looking to do business abroad, said she had been getting calls from American clients, anxious about whether an anti-Wall Street backlash might hurt their overseas prospects. Stewart-Allen, director of a company called International Marketing Partners, said one way for US exporters to retain foreign partners’ trust would be to show a willingness to cut prices. “They'll want to be careful about not looking too greedy," she said, adding that she thought the fallout would largely be limited to financial companies. What about brands that just sound financial? 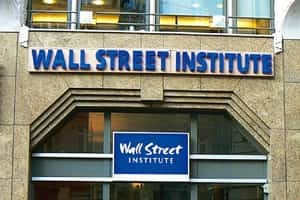 The Wall Street Institute, based in Baltimore, has no plans to change its name, said Tim Daniels, the chief executive. The company, which has more than 400 schools around the world, has opened 43 this year, he said, and enrolment has remained strong even as the financial crisis deepened. “That suggests to us that there hasn't been a negative impact from shaky consumer confidence, and there certainly hasn’t been any negative association with our brand," Daniels said. The institute was founded in 1972, so it has weathered previous Wall Street crises like the “Black Monday" of 1987. The company, which was started in Italy, is now owned by Carlyle Group, a private equity firm. The Metro ads in Paris claim that the Wall Street Institute has a “97% success rate"—a record that Wall Street bankers would be hard-pressed to match these days.